With a classic refreshing flavor, Pink Lemonade Stim-Free Pre-Workout gives you all the energy, focus, and improved blood flow you need for any workout, any time. 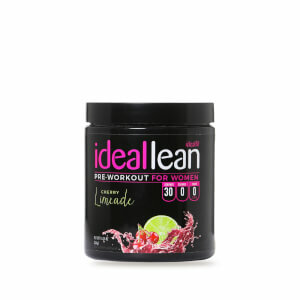 With no caffeine or stimulants, Pink Lemonade Pre-Workout is the delicious twist you've been looking for to amp up your results, without keeping you up all night. By naturally boosting blood flow during your workout, you'll get the most out of every rep, step, or spin. I love this product. I can workout and feel great after without any caffeine crash! This is my favorite product and flavor. Only disappointment is that whenever there is a sale, it is always sold out! I’ve started doing HIIT classes at my local gym at night. I have the watermelon ice preworkout, but needed an option to give me that “kick” but still be able to get to bed. After working all day, sometimes the last place I want to go is the gym. The flavor isn’t too strong, which I like, and it gives me that extra boost without the caffeine. I showed the ingredients and macros to my trainer, and he loved everything it was made with (he cautions us away from stimulants). The powder is a little bit more gritty, but just get some anger out shaking it! When I first opened the container the powder was a solid mass. I thought maybe the seal had been broken or maybe it was a bad batch. With customer service help I was informed that due to the type of preworkout powder not having a certain ingredient this is a normal state of the powder. Just had to break it up and it resolved very quickly in water. Love the taste! Give me a little boost without making me feel jittery like other preworkout powders tend to do. Will definitely be getting more flavors. I am extremely sensitive to caffeine, any amount after 3 PM keeps me up all night. I have been searching for about a year to find a caffeine free pre-workout that works and gives me a good boost. I've tried too many other products, but this is the first one that I gives me the energy I need! It tastes great and I'm able to crush my workouts. I will forever re-purchase!! 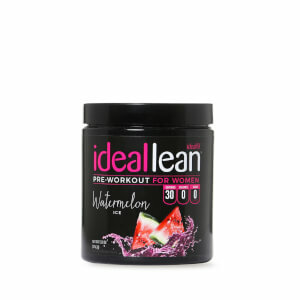 This Pre workout is amazing. It is one of the best flavors. It taste just like pink lemonade so delicious! 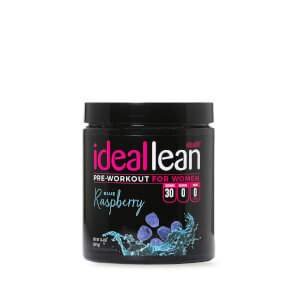 This is my top flavor for pre workouts, helps me through my tough workouts when it's been a long week! I have never taken pre-workout before and I was a little hesitant to start. I DID NOT want to feel jittery or like I'm about to jump out of my skin. I will absolutely repurchase IdealLean. This stuff is amazing! It didn't "hype" me up or anything. It enhanced my performance in the gym, gave me that extra pump and makes me feel great. Even my workout partner said, "Wow, you are going harder lately." My only negative is the flavor. I got the Pink Lemonade and it was okay, not terrible but not great either. I will try a different flavor next time. It did what it said it would do. 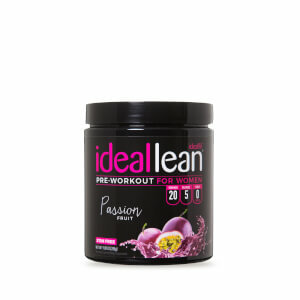 Great pre workout boost but it started to clump up about a week or so after I opened it.